This Question and Answer column is a regular feature. CHAMELEONS! welcomes questions from the readership. Don will gather the submissions and pick representative questions to answer in forthcoming issues. As is typical with Q&A columns, Don cannot respond personally or answer all questions that are submitted. He will select the questions that he feels offer the most benefit to the general readership. As the questions are answered bi-monthly, only time insensitive questions should be submitted. Questions may be anything regarding chameleons from husbandry to politics. Submit questions to Don.Wells@chameleonnews.com and include "Q&A" in the subject box. Questions may be edited for length and clarity. Q. While searching the web for info on Veiled chameleons, I came across your site and found the Q & A column. I have a question: I found a baby Veiled at a pet store, it is not receiving proper light and I highly doubt that it is receiving proper food. I would like to save it and see if I can help it. It appears to have vitamin D deficiency as it has a hump near its tail at the lower back and it limbs are bent. Can this little critter be helped or am I throwing $95.00 down the drain? A. Rita, Sometimes its just better to quit while you'e ahead. Your concern and desire to help this poor animal is commendable but in truth you probably are wasting hard earned money and the animal will die anyway. The best thing in my opinion is to try to get the pet store to stop carrying these animals unless they want to really learn and provide the best care possible for them. Perhaps you won't save this hapless animal but you might save the lives of many more in the future. Try to get this place to realize the that they are keeping the animals in a substandard way and that there are many sources which provide information and the equipment to make it much easier to keep chameleons successfully. A lot of stores don't appreciate the customer telling them what to do and how to do it so tread lightly and hopefully they are open minded and really want to learn. Good luck! Q. Concerning the use of Panacur or Fenbendazole, how do you dilute it down so that an accurate dose can be measured? I have found the paste form readily available but it is in very high concentrations, usually for horses. The paste is not water-soluble. It is not practical to try and administer a dose of .05 of a gram. The liquid Fenbendazole is apparently not legal in the USA. A. I am not a veterinarian and this information is best given by a vet! I am not aware that Panacur/Fenbendozole is not sold in a liquid form in the U.S. The last time I checked it was available but is a lot more expensive and most people don't need half a gallon of it! Likewise I have never had any problems diluting the paste down with just plain water. If you have a chance to speak with a knowledgeable vet about this I am sure they can help you with dilution rates and administration at the proper level. Most vets nowadays are very willing to help the interested person keep their animals wormed. A. You will be happy to see this issue of Chameleons!, I am quite sure that some of the information found in this issue has never been published before and I hope will answer all your questions and perhaps even make you think up more! We have a lot to learn regarding C.melleri. They can be the easiest animal in the world to keep for some and the hardest for others. There doesn't seem to be any set rule for husbandry. I recently saw some animals that were kept in small enclosures for a year or more and they were faring pretty well. Something that probably only a very advanced keeper should try to attempt. I think the first thing anyone interested in Melleri should do is insist on younger animals to start with. Captive bred offspring is the ideal choice. The younger Melleri seem to adjust to captivity much better than do older animals. This is a good general rule for all chameleons. If everyone insisted on buying younger animals there would be a lot less problems and probably more breeding in captivity and less removal of chameleons from the wild. Unfortunately people want full sized adult animals, with their adult coloration and at the lowest price possible. These just don't go together in a real world especially with captive bred animals, which are far better for the pet owner to start with. Adult, fully colored animals from the wild are most often poor candidates for the beginner and even for the experienced hobbyist. Q. I have two young female Veiled chameleons (Sheba & Darsa); purchased in June at about an inch in length (nose to the base of the tail). They are now (3 months later) about 3 inches and remain in the same cage (24"x20"x36"). Though they have grown very fast I had not seen either one of them molt until recently. I was surprised one day when in the course of minutes Darsa molted her entire skin. But what surprised me even more was that Sheba immediately ate Darsa's sheddings!!! Is this unusual? A. It's perfectly normal for many species of reptiles to eat their old skin. I have seen single animals eat the shedding skin of another animal on several occasions. Skin has many nutrients in it and possibly this is the reason they do this. Oftentimes a reptile in a shed stops eating and perhaps it is the reptiles way of acquiring an easy and immediate food source. I am not aware that this has been a proven scientific fact, but it does seem a logical conclusion. Birds molt, chameleons shed, as do all other reptiles. Just thought you would like to know that bit of trivia. Q. I was wondering if you could tell me if the Elliot chameleons or any chameleons hibernate. My Bearded Dragon just went into brumation and it scared me to death! I wasn't sure if chameleons did too. A. In general Chameleons are unlike many reptiles from temperate climates. They do not require a winter rest period. There are a few exceptions mainly in animals that come from areas that have cold periods. Records show that some species will actually burrow into the ground to sleep others just lounge around and don't move nor eat anything for a few months time. 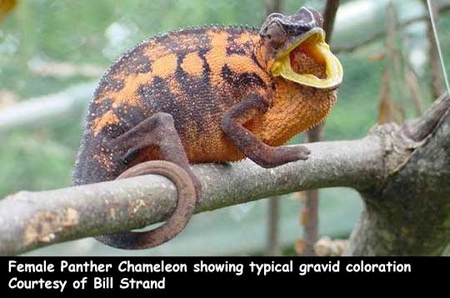 Elliots Chameleon is probably one species that does not need a hibernation period and I would advise you to just go with the flow and just watch your animal for periods where it seems to want to rest or not. Elliots come from a wide range of habitats and some come from very cold areas in the mountains of Uganda. Its possible some populations have adapted a semi hibernation mode but all reports I have seen, even the cold ranging ones, are active during chilly weather. Q. We have a pair of Nosy Be Panthers. The male is a blue phase and the female has not changed colors since we bought her. We have seen them breeding and think she is gravid. We have an endless supply of reading material on them and cannot find a picture that resembles our female, she is a very dark brown with the brightest orange markings I have ever seen. My question is, what does a gravid female Nosy Be look like. And do these markings sound normal to you? A. All Panther females to my knowledge will show the colors you mention above when gravid. These colors are what tell the male " Please not now". Usually after laying the females will lose these colors unless they are still carrying more fertilized eggs in which case they will once again get vibrant bright orange/red colors. I caution you to keep the two animals separate at all times other than for breeding. A gravid female especially will feel uncomfortable with a male nearby. It's just a good idea to keep all chameleons separately. They do not "pair up" like a lot of other species do. Am I getting fat or What? Q. I have a concern about my Chameleon. She seems to be carrying around a clutch inside of her but she is only 3 - 4 months old and we are not planning on breeding her. How do we remove the threat of her not laying the eggs and dying. Any input would be much appreciated. A. Your female chameleon is probably doing what comes naturally. Let's assume that your chameleon is more than likely a Veiled chameleon, which is a species that often will develop eggs at a very early age even when a male is not nearby. Females that receive lots of food and are kept in optimal conditions often will generate eggs and there really is little you can do to stop them. Just provide a place for her to deposit her eggs and live with it. Be sure she has plenty of good quality Calcium and other minerals and her laying eggs periodically will probably not affect her life normal span at all. Don Wells has worked with animals much of his life. His present interests include disseminating proper husbandry techniques for animals kept in captivity. He has kept multitudes of insects and continues to experiment with new species.